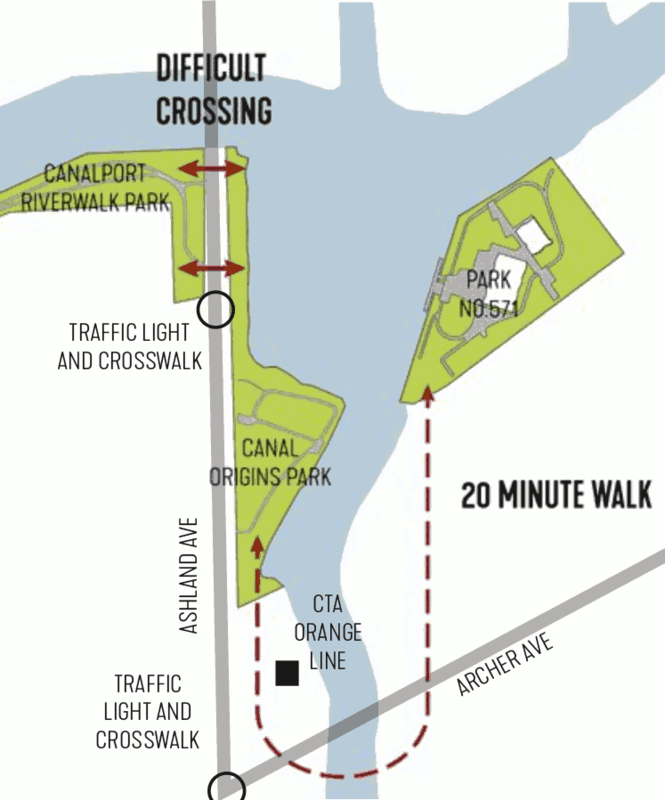 A graphic from the South Branch Framework Plan shows the "dis-connectivity" between the McKinley Park and Bridgeport sides of Bubbly Creek. The foetid waters of Bubbly Creek on the eastern edge of the McKinley Park neighborhood may soon begin to receive more attention and improvements, thanks to the Framework Plan for the South Branch Parks published by the South Branch Park Advisory Council. In the plan, which spans multiple parks around the headwater where Bubbly Creek meets the Chicago River, the South Branch PAC recommended a new pedestrian bridge connecting the McKinley Park and Bridgeport neighborhoods. A pedestrian bridge was the single most mentioned idea in the plan's public workshop, addressing an issue "identified as a primary problem," the framework document stated. The current route across Bubbly Creek involves a 20-minute hike on uneven, narrow sidewalks and under dark bridges; a pedestrian bridge would also improve the area's access to the Ashland stop on the Orange Line El, the plan said. McKinley Park neighborhood groups and leaders have recently thrown their support behind a proposed, non-binding Chicago City Council resolution to encourage national adoption of Carbon Fee & Dividend legislation. This measure addresses climate change by charging fees for carbon dioxide emissions of fossil fuels at the point where they enter the U.S. economy, returning funds to citizens in the form of a monthly payment. "Carbon Fee & Dividend will significantly reduce carbon emissions, create jobs, grow the economy, save lives and protect households from higher energy prices," the McKinley Park Development Council said in a letter to 12th Ward Alderman George Cardenas, who it encouraged to back the proposed resolution. Thanks to this and other advocacy — notably engagement from Horizon Science Academy students — Cardenas is supporting the measure and working to schedule a March committee meeting to take action on it, said Liliana Escarpita of the 12th Ward office. An architectural rendering provided by developers displays the north elevations facing Pershing Road for Parkview Commerce, left, and Parkview Lofts. 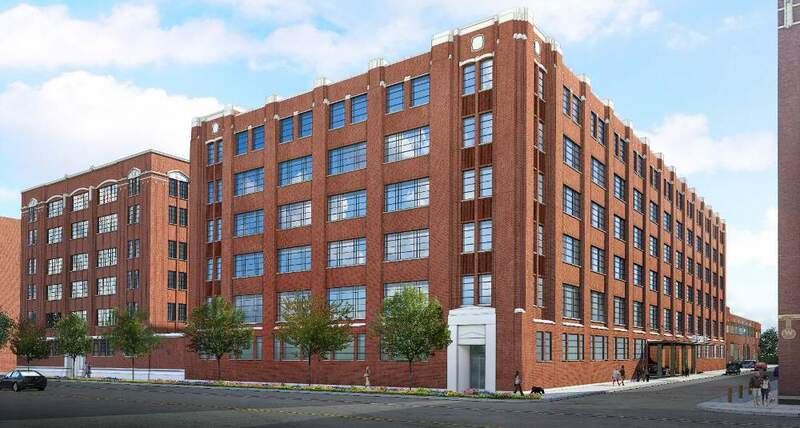 Parkview Lofts and Parkview Commerce, two conjoined development projects at 2159 and 2139 W. Pershing Road, Chicago, moved forward with community outreach at the Wednesday, February 20, meeting of the McKinley Park Development Council. The Parkview projects look to completely overhaul the two massive, vacant Central Manufacturing District buildings currently occupying the properties, filling them with more than 150 apartment residences and over 75,000 square feet of commercial space while retaining the historic presence of the buildings, developers said. Thomas Brantley, part of the Code Real Estate Partners team shepherding the development, outlined their plan at the council meeting and tallied the two projects' estimated cost of over $60 million. Build-out of the all-residential Parkview Lofts at 2159 W. Pershing would precede construction of Parkview Commerce, its mixed-use neighbor at 2139 W. Pershing Road, Brantley said, with a target construction start date of spring 2020. This Tuesday, February 26, is the City of Chicago municipal election, with consequential races for the McKinley Park neighborhood. In addition to Chicago mayor and treasurer, the 12th Ward City Council race has incumbent Alderman George Cardenas facing off against challengers Pete DeMay, Martha Rangel and José Rico. Early Voting at McKinley Park takes place at the McKinley Park field house from 9 a.m. to 7 p.m. on Monday, February 25, and residents can also register to vote during early voting hours. The Tuesday election will offer precinct-level voting at locations throughout the neighborhood; for more info, see the Chicago Board of Election Commissioners website. Are you getting in the mood for Mardi Gras? Marz Community Brewing Company presents its annual Pączki Fest on Sunday, March 3, celebrating the Polish version of Mardi Gras with homages to the classic Polish pastry, including the release of Marz's special Pączki Milk Stout beer, performance by The Herbsaint Band, food from local vendors and free admission. 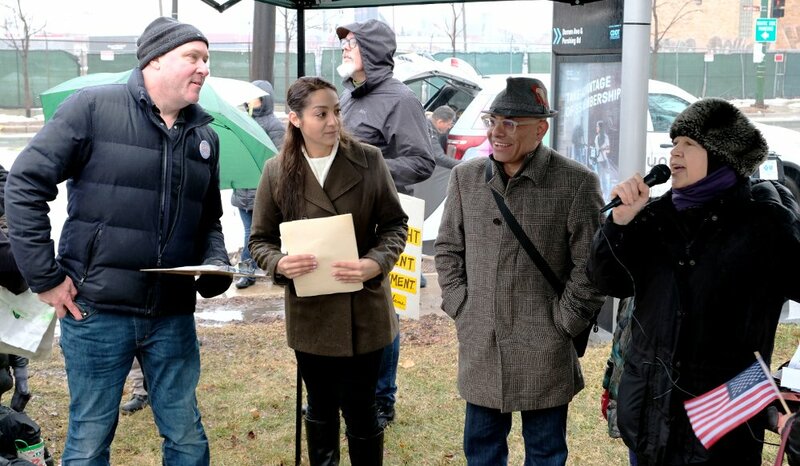 Event co-organizer Christina Martinez, right, introduces 12th Ward candidates Pete DeMay, left, Martha Rangel and José Rico at the Green New Deal rally on February 23, 2019, in McKinley Park. The Green New Deal March and Rally, held in the McKinley Park neighborhood on February 23, 2019, drew dozens of attendees and local political candidates to a march through the neighborhood and a rally in McKinley Park. The focus by speakers remained targeted on local environmental issues, and often included criticism of local industry, including HILCO developments in the Little Village Neighborhood and the new MAT Asphalt plant, sited across the street from the rally location. "We stand united in our hopes for the 12th Ward community," said candidate Pete DeMay. He, along with fellow 12th Ward aldermanic candidates Martha Rangel and José Rico, participated in the march and spoke at the rally, which attracted more than 60 attendees.